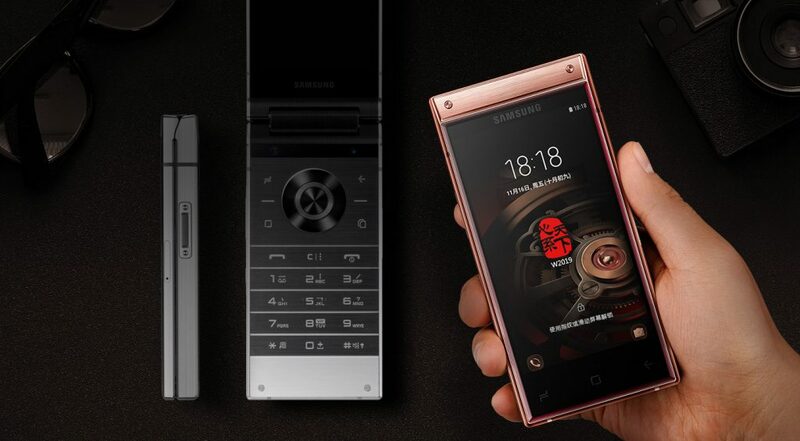 Samsung W2019 Flagship Flip Phone Unveiled in China - Playfuldroid! After months of leaks, Samsung has taken off covers from the Samsung W2019 flagship flip phone in China. Compared to W2018 that was unveiled in December 2018, the W2019 comes with side-mounted fingerprint reader, powerful chipset and dual rear shooters. The Samsung W2019 comes in two colors such as Gold and Platinum. The hinge that connects the two screens of the phone is made out of metal. A glass rear is present on the device. The handset features a side-mounted fingerprint reader and it lacks support for 3.5mm audio jack. On the outside, the Samsung W2019 features 4.2-inch FHD Super AMOLED display. The display can be found inside the phone. The Snapdragon 845 chipset powers the smartphone with 6 GB of RAM. It comes in two storage choices of 128 GB and 256 GB. There is a microSD card slot on the device for additional storage. The backside of the phone houses a horizontal 12-megapixel dual camera module with support for variable aperture. It is equipped with a selfie shooter of 8-megapixel. The handset receives power from 3,070mAh battery. The Android 8.1 Oreo OS overlaid with Samsung Experience UI is available on the W2019. The base model of the Samsung W2019 is priced at 18,999 Yuan ($2731). The pre-sale of the phone will begin on Nov. 11. There is no confirmation on the availability of the 6 GB RAM + 256 GB storage version of the W2019.